Readers to Eaters, 9780998436609, 40pp. It's a sleepy Saturday morning for most people, but not for Iris, who has to feed her many pets before Aunt Mary arrives. Iris likes to call Aunt Mary "Plant Mary" because she is a plant scientist. 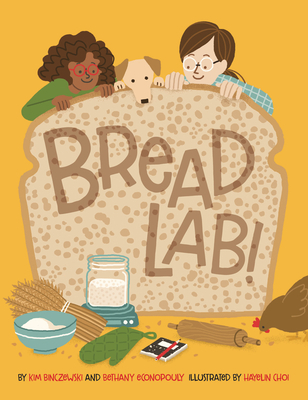 Today Aunt Mary wants to experiment with making whole wheat sourdough bread from scratch As the family kitchen transforms into a bread lab, Iris is surprised that bread needs only four ingredients--flour, water, salt and starter. She also learns about the invisible microbes that make the dough rise, and how flour comes from wheat grown by farmers. It all seems magical, but it's really science. Published in Cooperation with The Bread Lab at Washington State University, Mount Vernon. Sponsored by the Bread Bakers Guild of America. Kim Binczewski is the managing director of the Bread Lab at Washington State University in Mount Vernon, where her work includes field research, community outreach, and connecting farmers with bakers, chefs and businesses. She grew up on a small farm in western New York and studied Environmental Science in college. She lives in Bellingham, Washington. This is her first picture book. Bethany Econopouly has a PhD from Washington State University and an MS from Colorado State University, both in agricultural sciences. She previously worked at the Bill & Melinda Gates Foundation in Seattle. She currently lives near Philadelphia. This is her first picture book. Hayelin Choi made her illustration debut with Alice Waters and the Trip to Delicious, which earned a starred review from School Library Journal. She was born and raised in Gwacheon, South Korea. A visual storyteller, she studied illustration at the School of Visual Arts in New York City and is pursuing a graduate degree in graphic design at Maryland Institute College of Art in Baltimore, where she lives. Kim Binczewski is the managing director of the Bread Lab at Washington State University in Mount Vernon, where her work includes field research, community outreach, and connecting farmers with bakers, chefs and businesses. She grew up on a small farm in western New York and studied Environmental Science in college. She lives in Bellingham, Washington. This is her first picture book. Bethany Econopouly has a PhD from Washington State University and an MS from Colorado State University, both in agricultural sciences. She previously worked at the Bill & Melinda Gates Foundation in Seattle. She currently lives near Philadelphia. This is her first picture book. Hayelin Choi made her illustration debut with Alice Waters and the Trip to Delicious, which earned a starred review from School Library Journal. She was born and raised in Gwacheon, South Korea. A visual storyteller, she studied illustration at the School of Visual Arts in New York City and is pursuing a graduate degree in graphic design at Maryland Institute College of Art in Baltimore, where she lives.